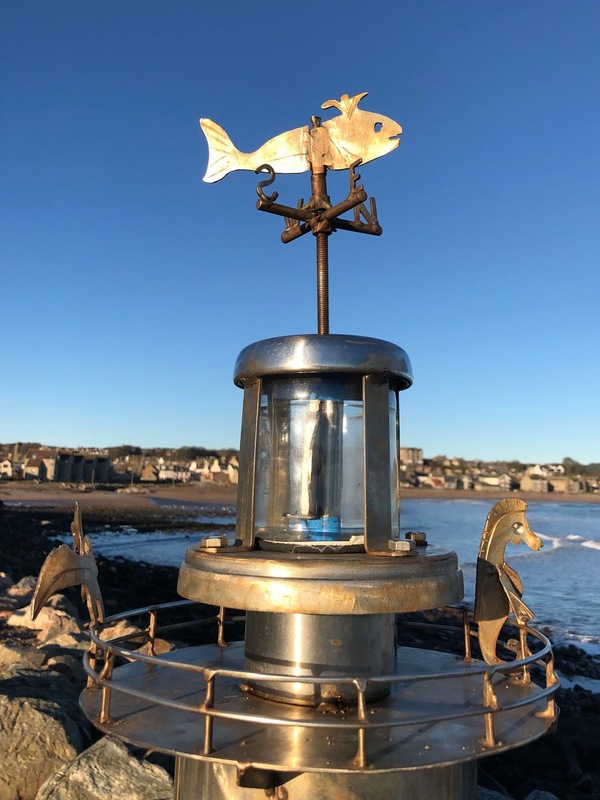 Top of your list of things to do in Stonehaven must be a visit to the whimsical collection of steel sculptures adorning the beach boardwalk. The artist is mysteriously unknown. Perhaps the 'Banksy of Sculpture'? 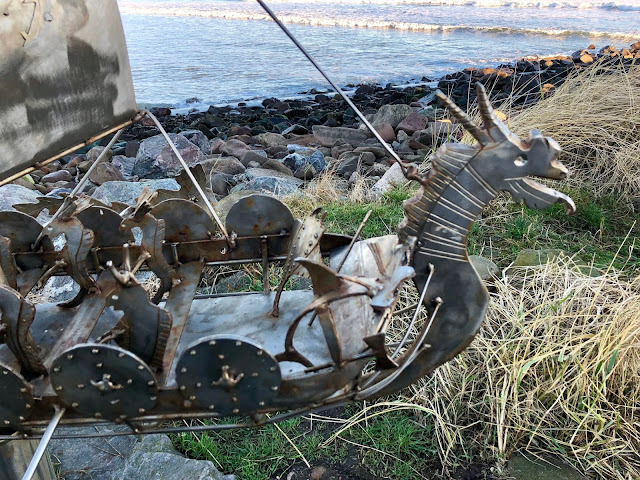 The fanciful creations include a lighthouse, fishing trawellers and a viking longship - all crewed by fish and crustaceans. What else to do on your visit to Stonehaven? Dunnottar castle is a must, plus the outdoor swimming pool, land train, a drink at one of the harbour pubs and of course at Hogmanay the Fireballs. We're all guilty of not always appreciating what's on our own doorsteps and sometime we need a wee bit of reminding. A BBC news story last week about Stonehaven's secret sculptor prompted me to pull together this post sharing details of a collection of fanciful metal artworks that grace the boardwalk in Stonehaven. I regularly walk past these clever creations and often share photos and videos of them on my Instagram account but have never really thought about the where, when, why and how of their existence and the fact that new ones keep appearing to enthrall and delight. There are now five sculptures in total on the boardwalk which runs from the Backies car pack at the harbour to Salmon Lane. The most recent one appeared late last year and it's addition seemed to spark a renewed flurry conversation as to who was behind them. They don't seem to be signed in any way and no one seems to know who the artist is. 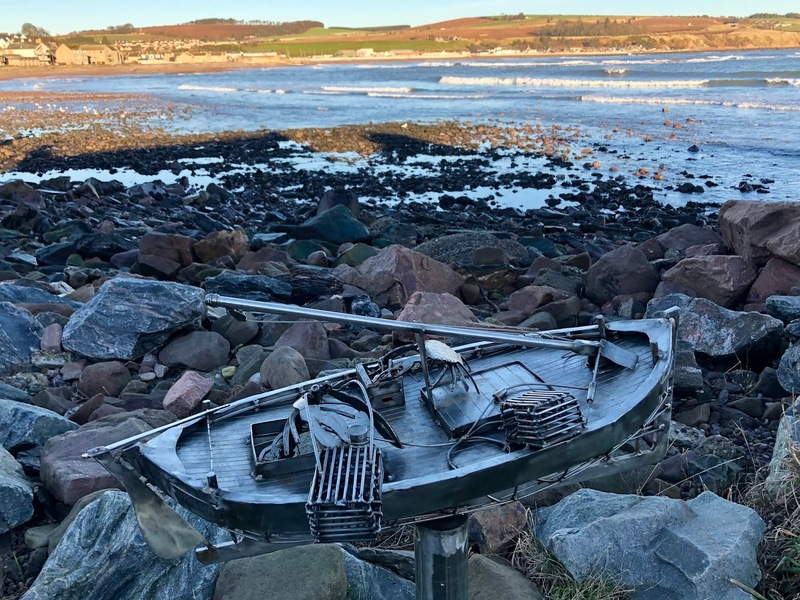 Who is Stonehaven's secret sculptor? 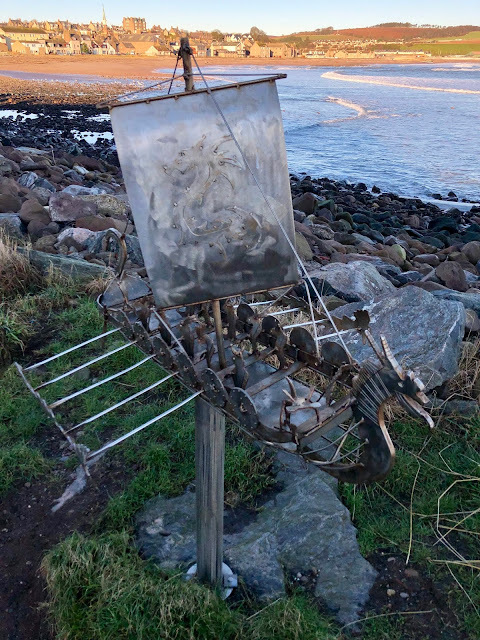 Now being tenuously referred to in the media as the 'Scottish Banksy' or the 'Banksy of Sculpture', whomever he/she is they have a fantastic imagination, amazing skill and are making a lot of people happy with their creations. 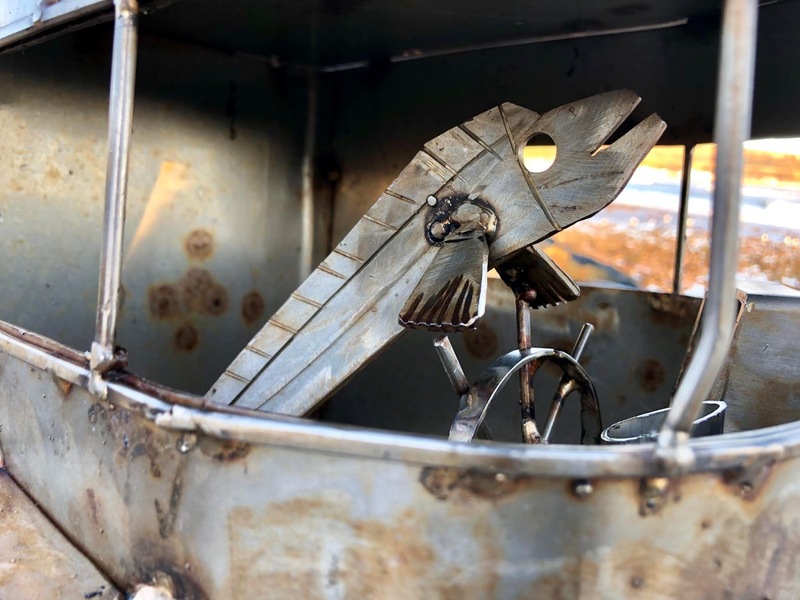 The common theme with the sculptures is a link to the sea but in all of them the traditional roles have been reversed with fish and crustaceans taking the place of humans and vice versa. They are all amazingly detailed and I'm sure I discover something new in each one every time I stop and look. Photo opportunities a plenty with the picturesque town of Stonehaven and the North Sea as a backdrop. I think this might be my favourite one. 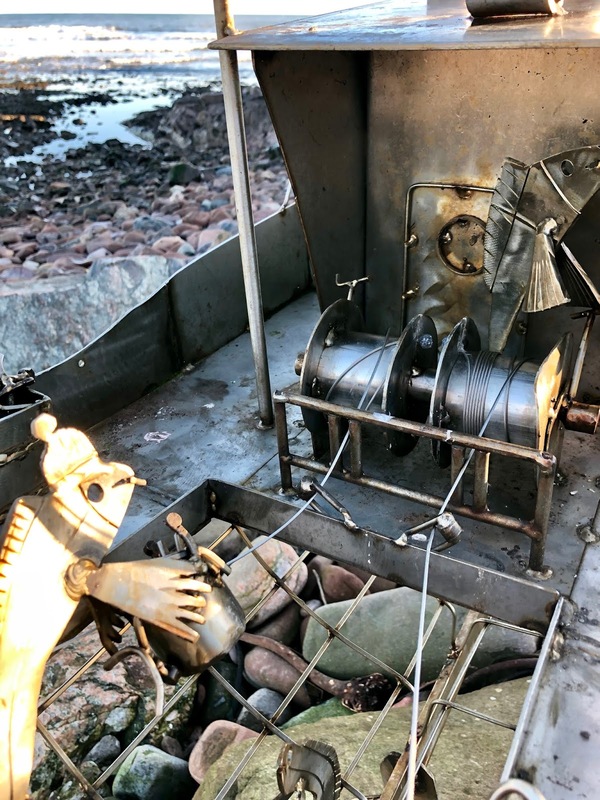 It lights up in the evening and you can look in through the windows and see the fish that live inside and man (or should that be fish?) 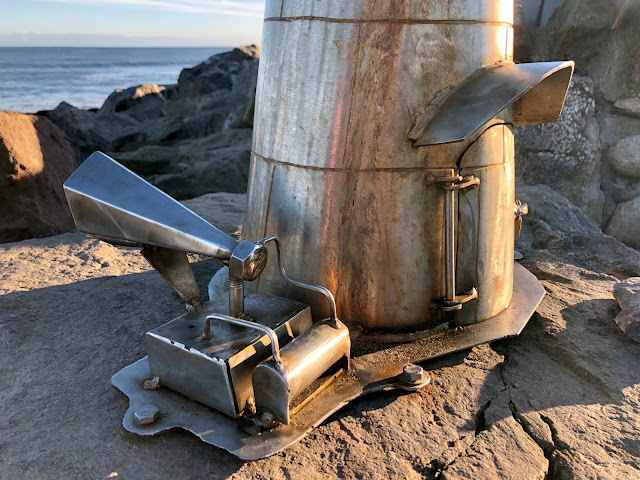 the foghorn. Crewed by fish and fishing for men. I particularly love the little seahorse in this one with the funky hair and long snout. The Viking longboat is of course crewed by viking fish complete with horned helmets. Possibly the most intricate and detailed piece of the five sculptures. 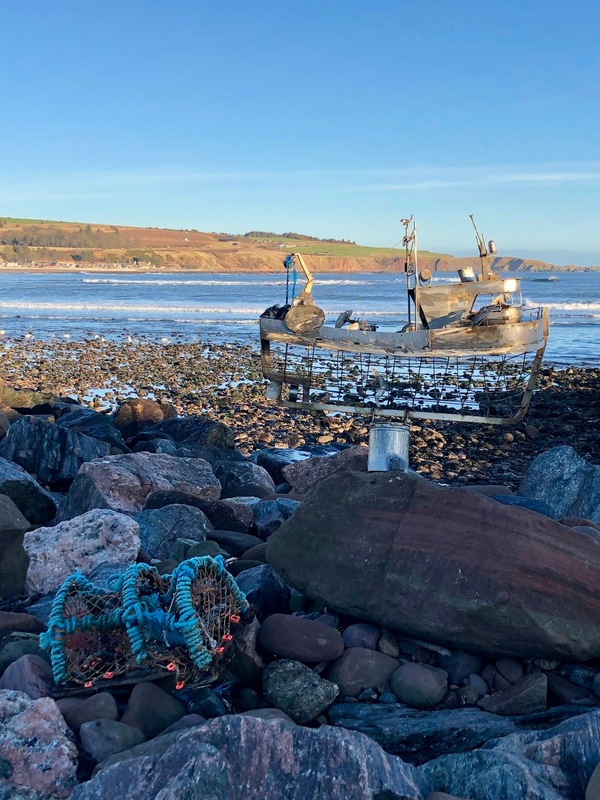 This is the most recent sculpture to appear at the end of 2018 and perhaps gives some clues as to the artist's identity as the crab is called Seth, the lobster is called James and 'Rose 5318' is inscribed on the flag. Perhaps the date 05/03/18 is significant to the artist? The catch in the boxes are human skeletons. I'm pretty sure that this was the original sculpture of the five although I'm willing to be corrected. 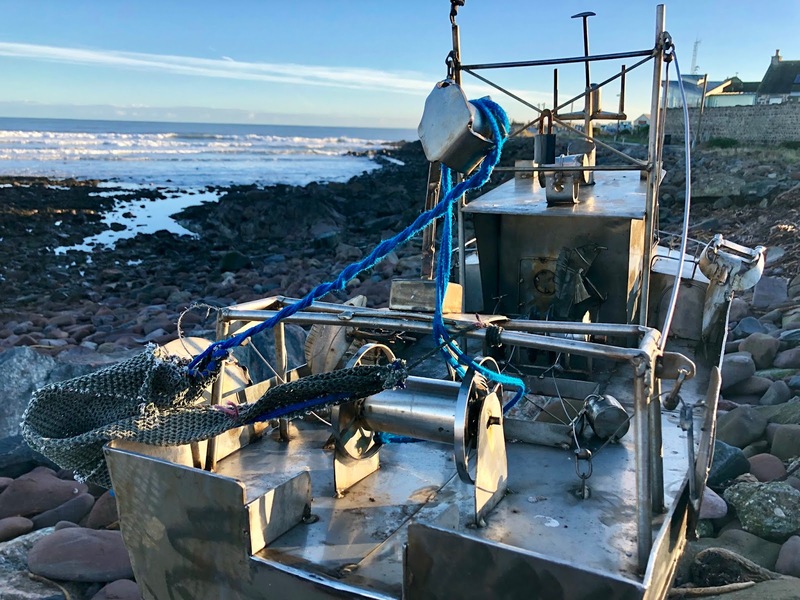 You'll need to head out onto the rocks to see this one up close where you'll discover that the catch in the nets of this fish crewed ship is matchstick men. 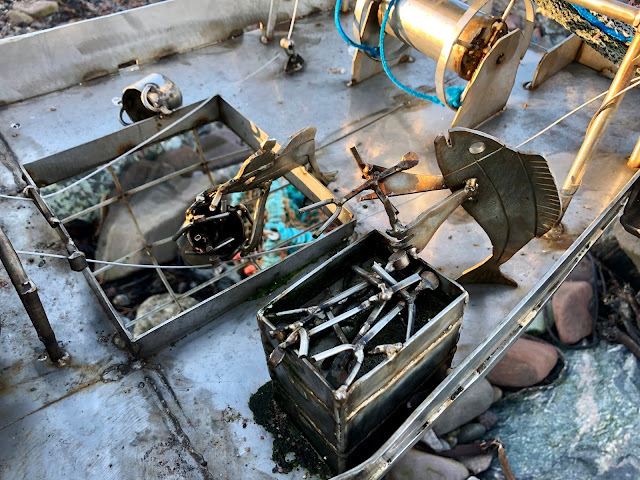 Have they been shipwrecked on the rocks? Rather disrespectfully a 'love lock' has been attached to this sculpture. Hopefully this doesn't start a trend for more. It would be most remiss of me not to share my favourite eating and drinking spots in Stonehaven as there are many delights to be found just a stones throw from the seashore steel sculptures. 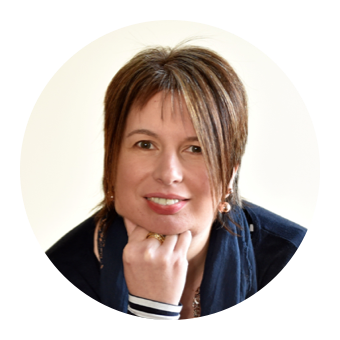 Where to eat in Stoenhaven? 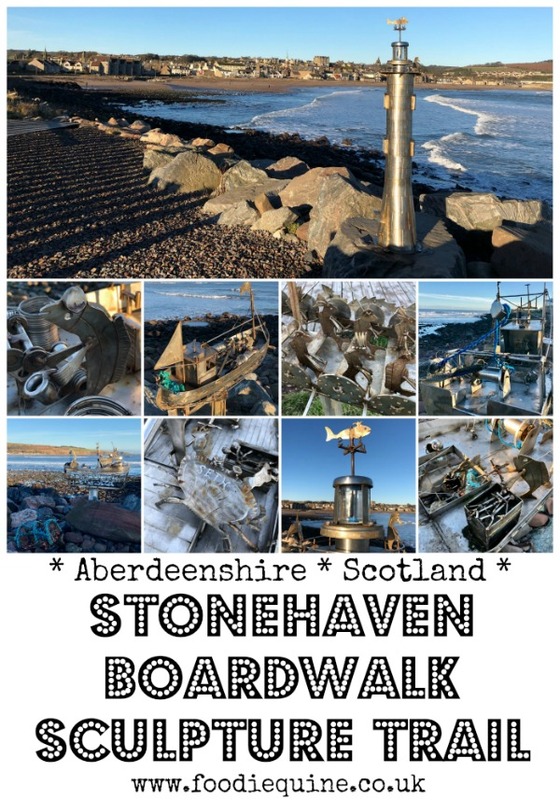 Fun things to do in Stonehaven? 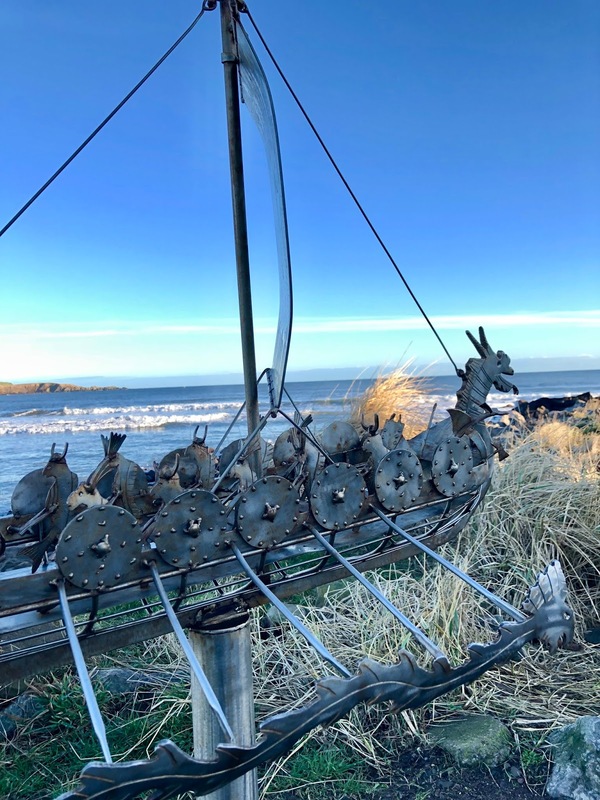 These look amazing - I can't believe no one knows who made them, but then again there are so many talented artists in Aberdeenshire; it could be any of them :D I like how the animals are steering the boats and throwing out the nets/crab cages - I'll interpret that as an environmental critique! Need to see these next time I'm up that way! I love how quirky this is, especially the air of mystery. Will have to take the boys for a beach walk, sculpture spotting and an ice cream soon.